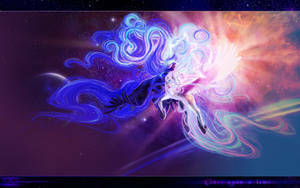 Wallpaper and high resolution copy of one of my Canterlot palace paintings. Please respect my work. Don't crop it. Or claim it as your own. Or try to sell it. Would it be o'k if I used this as a backdrop to a gift I made for a friend? Hello. Would you mind if I use this as a cover for a fanfic I plan on writing? I'll link you to the story when I'm done with the first chapter so you can know for sure that I credited you. Stunning use of different shades for the clouds. I like this picture very much. Would you allow me to use it as background for a Canterlot-inspired orchestral piece I am writing? Of course you would be credited. I'm happy to pay you for the privilege if you have a Paypal account. You may use my work as a cover image so long as you credit me with a link back to my gallery. Thank you for your generosity. I will let you know when I post the music. Can I use this for a school project? As long as you credit me. Hey, Can I use this image for my video analyses? It will be in the end credits and might need to be cropped. Additionally, I will credit you. Please reply at your earliest convenience. This is my Galaxy 3 wallpaper Great job!! Hello, amazing picture. Welcome to my desktop. This is beautiful. Do you mind if I use it as artwork for my next tune I'm putting on Youtube? I do so love pictures of Equestria landscape, it fills me with a sense of longing and desire, with a heavy heart to follow as I realize I shall never gaze upon this magnificent place with my own eyes. Very well done, I'm truly envious of your skill. This picture is absolutely perfect for a story of mine. I wonder, if I may use it? My dear, I love your work. You have amazing attention to detail, which is exemplified in this artwork. The colour scheme, the textures, every little bit of it is amazing. ;3; why can't I paint like dis? Hello there. I just wanted to let you know that the tumblr user lil-miss-jay has used your art as a background on one of his art pieces and sold it as a commission. He claimed to have used the art without permission, so I thought that it might be interesting to you. Beautifully atmospheric! I love the colors. Could I use this image for a story? Yes. As long as you credit me with a link back to my gallery. No problem! Thank you sir! do you have an even larger version of this? like really really big? Could I use this as a background for something?I'll give you credit. As a personal desktop or webpage background, yes (as long as it remains unaltered). As a background in a drawing, no.